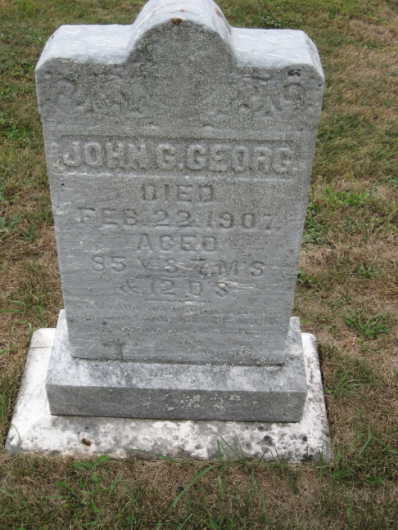 John G. (1821-1907) b. Strassendorf, Saalekreis, Baron, Sachsen-Anhalt, Germany; r. Accident, Garrett Co., MD (possibly son of Georg Georg; grandson of Johann) not be confused with Johannes A. George (1815-1894) b. Saxton, Germany, and married Kathrina Simon (1827-1911). Our John’s second wife was Eva Kathryn Fisher. They are buried at Zion Lutheran Cemetery, Accident, MD. Another John Georg I was Elector of Saxony (1585-1656). Emigration: one or more of three brothers, possibly George and another also named John (A?)(1819-1880? ), and father came to America as boys between 1840 & 1850. They landed probably at Baltimore, although one source says that a Johan G. Georg and wife Louisa arrived in New Orleans on board the ship Austerlitz in 1847, having sailed out of Le Havre, France. One source records their birthplace as Stroessendorf, Bayreuth/Bavaria, Germany. Another source claims Johan could have sailed into New York City from Baden, Bavaria, through Le Havre as early as 1837 on the Formosa. The given name Phillip is associated with this John. -burial: St. John’s Lutheran, Cove, Accident, Garrett Co.
-burial: St. John’s Lutheran Cemetery, Cove, Garrett Co.
-burial: Mt. 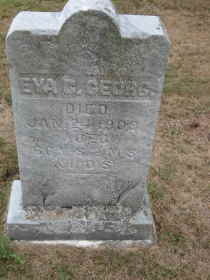 Zion Lutheran Cemetery, Jenner Twp., Somerset Co.